A few years ago I had the chance to go to Australia and train there. I discovered high level and very dynamic female BJJ community. To make you discover it I interviewed an amazing athlete I had the chance to meet. The triple world champion : Livia Gluchowska. Hi Livia, please introduce yourself : who are you? Where are you from? Where do you live? I’m Livia Gluchowska and I’m a BJJ brown belt under Lachlan Giles. 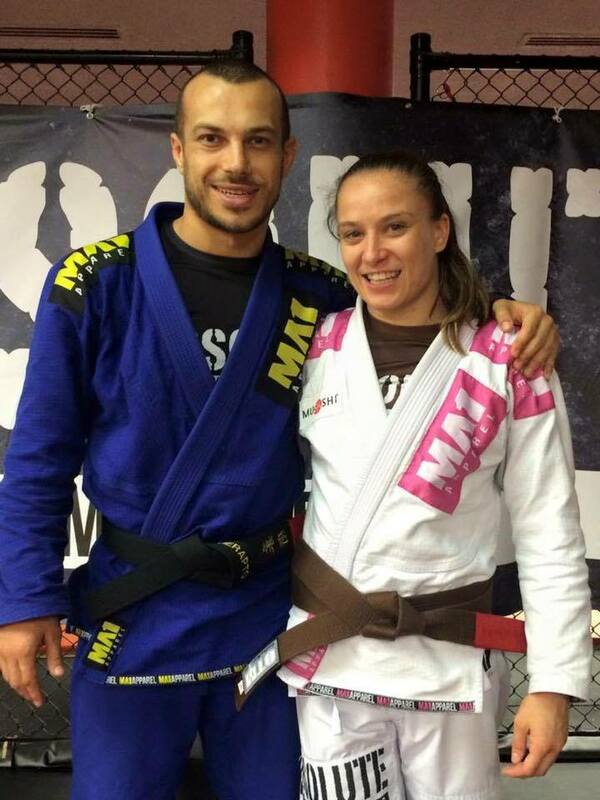 I am also a full time physiotherapist and a women’s BJJ coach at Absolute MMA & Conditioning in Melbourne Australia. Where/how did you start Brazilian Jiu-jitsu? I started jiu-jitsu at the end of 2010 after meeting my partner Lachie and travelling to Brazil. I got sick of partying and BJJ looked fun so I decided to give it a go. I was a high level athlete my whole life (rhythmic gymnast for 12 years where I represented Poland and Australia, then a sprint cyclist for 6 years). I then decided to get a degree and therefore wanted to give up elite sport to focus on my career, but that didn’t last long. I competed after 3 months of training and fell in love with BJJ and haven’t looked back since. What place does Brazilian Jiu-Jitsu take in your daily life? I am a part owner of our school Absolute MMA & Conditioning in South Yarra Melbourne, Australia. I coach the women’s program and besides that I train every day, twice a day apart from Sunday when I rest. I work as a physiotherapist and teach clinical pilates between training sessions. Would you please speak about your BJJ career? I never intended to compete when I first started BJJ. As a white belt I lost a lot and only won a few fights in competitions. When I got my blue belt, wasn’t amazing in any way but after I competed at my first World Championships in 2012, something changed. I lost in my 2nd round, but as I walked off the mat I believed that I could one day match it with the best and become a World Champion. For the next year, I followed a program that Lachie and I wrote. I drilled, did specific trained, lifted weights, competed a lot and executed the plan perfectly at the 2013 Worlds and won the World title. I then received my purple belt and few months later won the 2013 No Gi World Championship. After 2013 No Gi Worlds, Lachie and I then lived in Brazil for 6 months, training and competing. My best results were a silver at Brazileiros and a few wins at local competitions in Brazil. In 2015 I won a silver medal at the World Championships at purple belt, which was devastating at the time. I also missed out on qualifying to ADCC, by coming second at the Asia/Oceania Trials in Japan. In December 2015 I received my brown belt from Lachie. Few month ago I competed at the 2016 Abu Dhabi World Pro, where I beat a tough black belt and then got to fight my idol Michelle Nicolini (who triangled me rather quickly). I just got back from Los Angeles, where I became the 2016 World Champion in brown belt rooster division and I am still on a high from it! Besides that I hold other titles like Asian Open, numerous Pan Pacific, Australian and State Championships. Your partner also does Brazilian Jiu-Jitsu at a high level. What about sharing your passion with him ? It’s a dream come true. I love sharing this journey with Lachie. He is my coach and a very good one at that. He is patient, kind, supportive, extremely technical and analytical, keeps up with modern BJJ, and is sometimes tough on me. We get to travel together and often go through the same emotions and ups and downs. In the end we laugh a lot – both with and at each other. You opened your own academy. Would you please speak about it? What is your motivation? What about training people and training for yourself? Is it hard to find a balance? Lachie and I are part-owners of the academy. We opened it a year and a half ago and it has gone from strength to strength since. We have the best competitors in Australia, but we also cater for beginners. I am so lucky to have so many amazing training partners of different sizes and abilities. We hang out a lot and have a great team atmosphere and I am very proud of what we are creating. Women’s BJJ has also grown – a year ago it was just me on the mats, now we have between 5-15 women on the mat any given day! I love helping the girls develop, but they also help me a lot by being great training partners. What about the australian BJJ scene? Australian BJJ scene is growing rapidly. We have many academies in every city, lots of competitions throughout the country and some great fighters – results are starting to speak for themselves. This year at the World Championships we had 5 gold medalists, which were all female (brown, 2 x purple, 2 x juvenile blue). Three of us were from Absolute MMA! That is quite an achievement. The men are doing great too. We have Lachlan Giles representing Australia at EBI and Copa Podio, Craig Jones is a purple belt World Champion and also will be at Copa Podio, Rod Costa won a silver at this year’s Worlds as a brown belt, Ben Hodgkinson placed at the Europeans and Levi Jones is an amazing up and comer! What about the australian female BJJ scene? What is your vision of it? How do you think it would evolve? There are so many ladies training and competing these days in Australia. There are already juveniles winning their divisions at the World Championships, and we have gold medalists in every belt level! I think everything is going in the right direction… Hopefully in a couple of years we will see a few of us competing in the black belt division and making waves and winning medals. Many clubs are also offering women’s only classes, which increases participation and retention rates for women. In January I even taught 130 women at the Australian Girls In Gi Camp (AGIG), ranging from beginner to advanced. That was a massive achievement by Jess Fraser to organize such a huge event and get everyone sharing the mats in such a positive way. Would you please tell me more about Australian Girls in Gi (AGIG)? 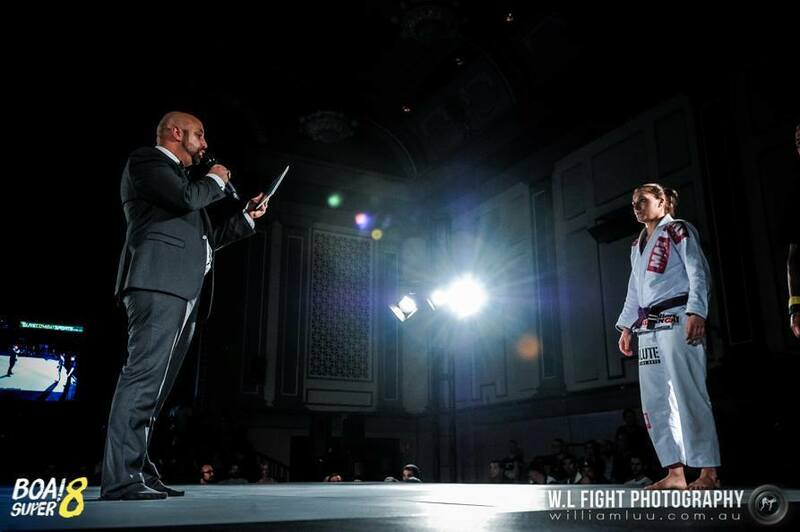 You compete at a high level, trained in many countries… What did you like/dislike? I like most things, apart from having to have to travel so far. It’s costly and time consuming and I can’t take part in as many competitions as I would like. In terms of training, I love visiting different academies and seeing how everyone prepares, drills, rolls and how they teach. I love it when training is specific and relevant to BJJ. I have a pet hate of doing 30 min warm ups of running and push ups as it doesn’t really translate to BJJ as much as for example drilling does. Besides that, meeting new people and catching up with old mates is the best thing about competing and training overseas. What do you think about the place of women in BJJ? Their image? What has been your greatest experience? I think women are being noticed and finally starting to be taken seriously. I have only had great experiences. I have been welcomed everywhere and treated as an equal. I work as a coach at my club, teach private lessons and get all the respect, just like the men do. I think if you act professional, you get treated as one in return. It would be nice to have the same opportunities as the guys in terms of invitational competitions, sponsorship and coaching roles, but hopefully we will set these up for the next generation of women coming through. My greatest experience has been winning 3 World Titles. All of them felt different and meant different things on a personal level, but I will never be able to describe that feeling in words. Coaching women and seeing them develop their games and fall in love with BJJ has been inspirational. I simply love my job. 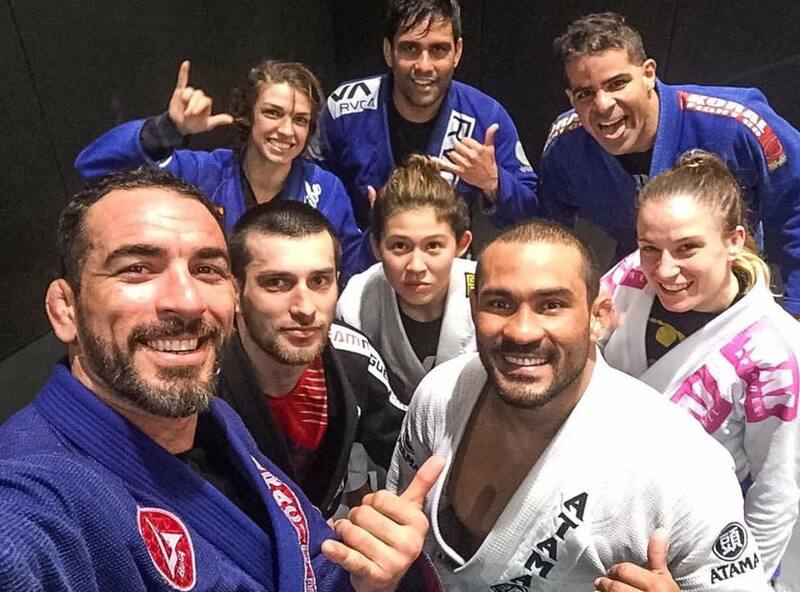 You recently trained with legends like MacKenzie Dern and Braulio Estima. Competed against Michele Nicolini. How do feel about meeting this legends and entering the highest bjj Level? I never thought this time would arrive so soon for me. Michelle and MacKenzie are my idols and to be able to train with and compete against them is a dream come true. I still have a very long way to go to reach their level, but you simply can’t buy that experience. It will take a lot of sweat, blood and tears, but I’m ready for the challenge. They have given me so much hope and motivation and I hope to one day be half as good as them. What are your future BJJ goals? I would like to do No Gi Worlds this year, qualify for ADCC and eventually I want to compete at Black Belt Worlds. I am the first Australian (male or female) to win brown belt gi Worlds and now I want to aim to medal at the black belt level. With enough hard work, I might be able to get there. What do you wish for the australian BJJ? I think Australian BJJ scene is much more competitive than people may think. We are getting stronger and better each year and gaining good better results internationally. Many top competitors train together to get better – Absolute MMA has an open doors policy and everyone is always welcome. I hope we continue that way – no politics, modern jiu jitsu, unified team and lots and lots of fun! I also want to give a shout out to my sponsors MA1 Apparel, Musashi Nutrition, Combat Sports Nutrition, DEXA Melbourne and Core Tactics. Thanks Livia for this interview !